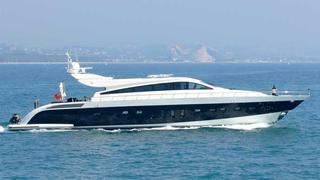 Vassilis Fotilas alerts me to the fact that he and Antoine Larricq at Fraser Yachts in Monaco have signed the central agency for sale of the 30.5m motor yacht Friday. Friday was built by Italy's Arno yard in 2007 and accommodates nine guests in a master, two doubles and a twin cabin plus a Pullman berth. Triple 1,800hp MTU engines driving waterjets give this superyacht a cruising speed of 37 knots and a range of 350 nautical miles. The asking price is €4.5 million.